“To an outsider, Milton finances seem like they ought to be simple, straightforward,” muses Rob Azeke ’87, trustee Budget Committee chair. Milton spent against revenues of nearly $60 million in FY 2015. What were those carefully allocated dollars aiming to achieve? Simple. Achieve the trifecta: Provide a superb educational experience for every child. Emphasize those long-held Milton values. At the same time, test what tomorrow’s Milton students should learn, and how. The trustee Budget and Finance Committee oversees the annual budget process and authorizes the budget. As the trustees weigh Milton operations in the short and long term, they consider key building blocks: tuition, financial aid, and compensation. Dollars allocated to each of these areas grew between three and four percent over the last five years, with the exception of tuition, which stayed flat during the most intense year of the recent recession (2009). Budgets are statements of philosophy. Resources are finite, and the budget must be balanced. Therefore, the commitments in the Milton budget are annual resolutions for meeting well-known, competing needs. For example, alumni often say that Milton’s value is rooted in relationships: faculty connected with students — through the classrooms, dormitories, advising, coaching, directing. Compensation dollars fund the faculty who choose Milton’s level of professional expectation. Compensation dollars must convince today’s teachers to stay, attract new faculty, and empower teachers to grow at their craft. Students are Milton’s educational yeast. They shape the School culture — the intellectual and social environment. A majority of families are unable to afford Milton, however. In recent years, 55 percent of prospective Milton families applied for financial aid. Thirty percent of Milton students receive financial aid. Relying on tuition increases over time to meet costs is unsustainable. In addition, tuition increases require a commensurate investment in financial aid, to offset the impact of the higher tuition. Philanthropy bridges the gap between what revenues provide and what a Milton education costs on an annual basis. Tuition funds roughly 75 percent of Milton’s operational needs. A percentage of endowment earnings, gifts to particular programs, and Annual Fund dollars combine to make up the difference. The Annual Fund raised $4.39 million in FY15, and all of those dollars will fund school operations in FY16. A “dynamic equilibrium” is the way one former trustee described Milton’s budget. The operational challenges at Milton are familiar ones for schools, nonprofits and corporations, and none were unscathed by the financial crisis, which particularly affected organizations dependent on endowments, like Milton. During the financial crisis, Milton trustees and administration established practices to carefully manage operational, capital, and investment decisions. These practices have allowed Milton to manage operational realities and also prepare to pursue key strategic initiatives critical to student success. For instance, after personnel reductions during the financial crisis, Milton has added faculty and staff over the last five years. A number of faculty lead new programs, like Spanish in the Lower School and a dean of teaching and learning in the Upper School. Other additions are student-centered professionals in the Health Center and the college counseling office. New staff members support human resources and technology, facilities maintenance, communication, development and administrative support. Employee benefit costs grow annually. Developing or maintaining appropriate technology infrastructure and tools, for the business and learning sides of Milton, is another cost-intensive pressure. Milton is disciplined about spending on deferred building maintenance, but the dollars needed to rejuvenate assets on a campus with 135 acres and 60 buildings outpace the annual commitment. Milton has realized operational efficiencies savings through key sustainability-related initiatives; solar and other energy-focused initiatives have allowed the School to reduce utilities expenses by roughly $450 thousand compared to five years ago. Since all schools need to react in real time to unplanned needs (the snows of 2015, for instance; a failed roof or steam line), Milton has set up funds to address contingencies, notably a trustees’ reserve fund. The trustees have also used this fund to pay for development of the Strategic Plan and campus master plan. Maintaining healthy contingencies safeguards Milton against resorting to less favorable strategies, such as borrowing — borrowing from the endowment, in particular. While unplanned needs inevitably arise, comprehensive, long-range planning is the board’s baseline. Milton’s ten-year financial model includes projections of key variables, the sources and the uses that determine annual budgets. Projections include numbers on enrollment, tuition, compensation, annual contributions, deferred maintenance, principal debt payments, endowment growth, payments on capital campaign pledges, and what we will spend to implement the Strategic Plan. The board adopted Milton’s Strategic Plan in January 2013, after an 18-month study that included input from every Milton constituency. The vision driving the Plan is that Milton become a magnet for the best teachers in the country to develop and practice their teaching, in close connection with highly motivated, original students. It defines a clear concept for ideal teaching, and an inspired template for students’ learning experience. The Plan allows the administration and trustees to align spending with Milton’s priorities. Providing Milton’s historic quality, day in and day out, is the primary standard that the operating budget must address. At the same time, the Plan makes the urgency and the impact of Milton’s capital campaign clear. The campaign is intensely people-centric. Advancing passionate teaching and learning, revitalizing it to make sure that students will thrive in an unpredictable future — that vision requires resources beyond what Milton has relied upon in the past. Growth in the endowment is Milton’s most pressing need. The campaign is an all-in effort to increase the capitalization of Milton’s core enterprise. Increasing the distribution from the endowment to Milton’s operating budget will be the crucial factor in our fulfilling a true leadership role for Milton teachers and students. 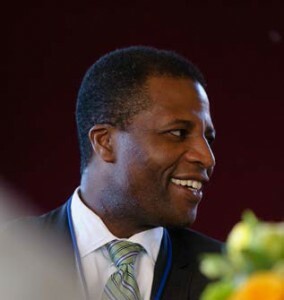 “Budgeting is the lifeblood of a complex institution like Milton,” says Rob Azeke ’87. “Milton’s budget matches the School’s finite resources with the often competing and seemingly infinite demands of its stakeholders. Milton has developed a culture of budgeting and accountability that includes every aspect of the School. At that point in his career, Rob took a sabbatical, traveling the world for 14 months. He credits this time, at the age of 34, for helping him develop the courage and resilience to navigate the challenges of being an entrepreneur — during the 2008 financial crisis in particular. Rob started the Sunday Group in 2004, which he closed down in 2008. Subsequently, he joined Parish Capital and then founded Farol Asset Management in 2011. “From a finance standpoint, Milton is on solid ground,” Rob says. “We have a strong culture of budgeting and accountability that focuses us on doing more with less. Our annual fundraising supports only eight percent of operations. The endowment supports 15 percent. We have raised tuition at rates lower than many of our peer schools and increased our student financial aid. John Fitzgibbons ’87 knows both sides of the Milton ledger: the sources and uses of funds. John immersed himself in Milton’s finances on the board of trustees’ Budget and Finance Committee when he was elected to the board in 2004. 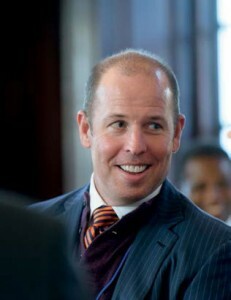 John chaired the Budget Committee during formative times, immediately after the recession of 2008, and he has led the trustees’ Investment Committee since 2013. John’s comments and graphics, excerpted for Milton Magazine, raise and answer important and frequently asked questions about Milton’s endowment. Why Does Milton’s Endowment Matter? Half of Milton’s $60 million operating budget is allocated to salaries and benefits, and the next largest allocation funds administration and operations. Those two expense items can be covered by tuition revenue. If we were dependent on tuition alone, other expenses that are essential to Milton’s identity and program would not be funded. Contributions from the endowment and from annual giving cover the balance of that operating budget. How does the endowment relate to the School, on a day-by-day basis? The annual contribution from the endowment to fund operations is a predictable number in the Milton budget, and therefore it is critically important to long-term planning. How does that work? The size of the endowment and the draw-down rate (over a rolling three-year period) determine the extent of the contribution from the endowment. Historically, that draw-down distribution rate has been 5 percent. It’s now at 4.6 percent, headed toward the board’s objective of 4.5 percent. A 4.6 percent draw-down rate applied to a three-year average endowment balance resulted in a $9 million contribution toward operations in FY15. Largely due to our predecessors on this board — because these endowment management decisions are made over time — the Milton endowment has materially outperformed the spending rate (4.5–4.6 percent) and outperformed its peers over a one-year, three-year and five-year basis. The important thing is how that translates into more resources for the School. At an average annual return of 12.6 percent over five years, we’ve been compounding an excess (above spending rate) return of eight percent during that period. The spending rate multiplied by the contribution amount would imply an endowment size of approximately $200 million. However, the actual size of Milton’s endowment is $262 million as of April 2015, due to consistent returns above the spending rate, which compound each year. As a result, we already know that the next few years will benefit from a material increase in the amount contributed from the endowment to fund operations. Going forward, if the endowment returns continue to exceed the spending rate, further budget contributions will be realized, enabling either budget increases or reductions in other sources (such as tuition). Negative value (on the y axis) indicates spending rate. Green indicates the additional return over spending. Yellow indicates gifts to the endowment. Returns in excess of what was needed to fund the spending rate carry forward and compound with future returns. Despite clear gains in the size of the endowment, the budget contribution amount does not appear from these charts to be increasing much. This is based on both rounding as well as the digestion of a difficult year in 2012, which will no longer impact contribution calculations after 2015. The next few years will likely reflect sizable increases. Roughly 70 percent of our asset allocation is in the equity market, including global, hedged and private equity investments. Our credit exposure includes private, non-bank lenders that involve relatively long commitments. Our natural resource exposure is captured in oil and gas royalty interests that are consolidated into two private funds. In terms of geographic exposure, global investment is important but conservative with respect to overseas risk taken. Nearly 75 percent is in the United States, and the majority of the balance is in Europe and developed Asia. We are managing the endowment in perpetuity, and we do look for illiquid situations that offer higher returns. Getting paid appropriately for illiquidity and long duration is consistent with the Committee’s strategic orientation. However, we are careful not to jeopardize the accessibility of the endowment should Milton need it unexpectedly. [One quarter] of the endowment could be liquidated in a single day. [Half] the balance could be liquidated within a quarter. The remainder would take more than a year to realize. Along with asset allocation, manager selection is where the Committee has been able to add significant value to the portfolio. Consistent selection of top-ranked investment managers accounts for the difference between top and bottom quartile endowment performance as measured against peers. The greatest performance variance between managers exists in the equity markets, and we maintain relatively high equity market exposure to capture maximum benefit from the Committee’s ability to select and gain access to high-quality managers. Among managers, we differentiate between core and non-core positions. Of 30 managers, 17 are core, and the rest are not. The core managers have earned our long-term commitment, and we invest in them with high conviction. The non-core managers all have potential to develop into core positions, but this can only happen over a long period of time, particularly if the positions are not immediately liquid. How do we manage this? What are the roles? 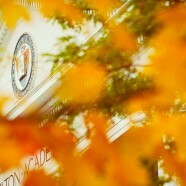 The board has ultimate fiduciary responsibility for Milton Academy. The board approves the investment policy that guides and restricts the discretion exercised by the Investment Committee. The board also monitors performance at regular intervals. The board’s responsibility to appoint members of the Investment Committee is a crucial one. Those members must be highly qualified, experienced, and prepared to commit significant time over many years. The Investment Committee’s ten members are experienced and committed; several members have been on the Committee for more than 20 years. They take on significant fiduciary responsibility. Roughly half are current trustees; several others are former trustees. This Committee also includes non-trustees with valuable expertise. The Committee determines the asset allocation targets; sources and approves each asset manager and allocation; regularly reviews detailed performance; and appoints Milton’s external investment advisor. The Committee’s advisor, Partners Capital, recommends asset allocations and asset manager allocations. Partners Capital monitors portfolio risk and performance between committee meetings, conducts asset manager due diligence, and supports Milton staff with accounting and reporting. Finally, asset managers directly invest the endowment assets in companies and securities. The managers must invest in a way that is predictable and consistent with their stated mandate. They must also be transparent, honest, well-governed, and have clearly demonstrated experience and expertise in their areas of focus. 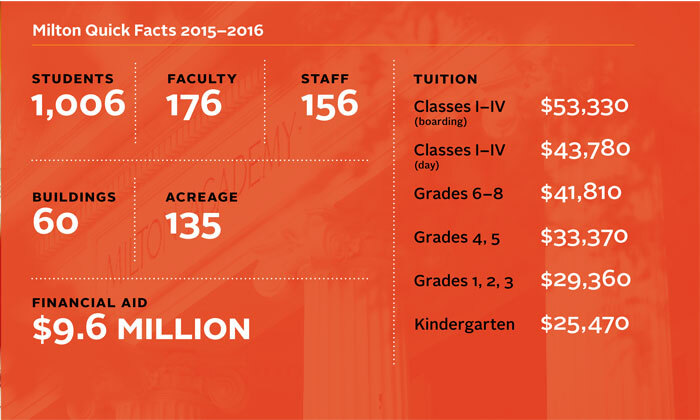 At $262 million, Milton’s endowment is smaller than that of our peers, both in the aggregate and per student. That means that every dollar the Milton endowment gains, either through gifts or investment performance, will have significant impact. Milton’s endowment management process is also highly scalable. As alumni and parents and friends add to this endowment, every incremental dollar will be put to work quickly and effectively. We will not have to change our process to accommodate an increase in resources. Ultimately, the power of the endowment is the most important determinant in our ability to fulfill Milton’s vision. Power to fund a greater portion of Milton’s operations with the endowment contribution is simply essential for success. Progress toward every objective depends on that equation: setting highly competitive compensation levels for teachers; sharpening their skills over time with top-notch professional development; gathering the most outstanding students around the Harkness tables; and constantly, rigorously renewing Milton’s curriculum for depth and relevance. With operational finances well managed, along with the endowment’s performance record and potential expansion, we are poised at a particularly optimistic point in Milton’s history. “These impressive returns are a reflection of process,” John Fitzgibbons ’87 says, “not luck.” John became the Investment Committee chair in 2013, succeeding Jide Zeitlin ’81. He attributes Milton’s excellent investment performance to Committee members’ decisions “over time,” crediting Jide and others who have had long tenure on the committee. “Longevity,” John points out, “is important on this Committee.” Noting that the Milton endowment has out-performed the draw-down spending rate (4.6%) and is a top performer among its peers, John focuses on long-term strategy to sustain that outperformance and to compound the endowment. Outside of his Milton role, John describes himself as an industrial manager. His long experience in the energy sector began with undergraduate research at Harvard during the Yeltsin era’s cultivation of the private economy in Russia, with a particular interest in development of Russia’s extensive oil and gas resources. He co-founded Khanty Mansiysk Oil Corporation, an oil exploration and production company, in 1993, and served as president and CEO until it was acquired by Marathon Oil in 2003. He has served as chairman of Integra Group since founding the oil-field services company in 2004. In 2010, John founded Basin Holdings, a global, industrial holding company. Basin manufactures equipment and provides services to energy and industrial customers around the world. Basin employs more than 1,000 people in 17 countries, operating 16 businesses in four divisions. Integra employs nearly 8,000 people in Russia. John regularly reports about Investment Committee direction, decisions and outcomes to the board. He introduced new levels of data transparency, first as Budget and Finance Committee chair, then as head of the Investment Committee. Grounded by a clear investment philosophy, the Investment Committee targets endowment performance in the top quartile of peer institutions. The Committee focuses on manager selection as the most important factor in achieving and sustaining performance at that level, according to John. The endowment’s asset allocation strategy is designed to reduce risk through diversification, a practice shared across most peer institutions. Manager selection adds the relative performance compared to peers that enables entry into the top quartile.